Insert adapter into programmer's ZIF socket. If you are in doubts about orientation of the adapter in programmer's ZIF socket, there is a rule of thumb - orientation of adapter's name text is the same as orientation of the text on the top of programmer. 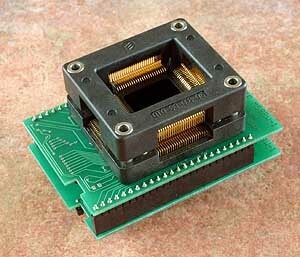 Visually check the placement of adapter in programmer's ZIF socket. Push the cover of adapter's ZIF socket (the topmost movable part) to open the socket. Insert the device into adapter's ZIF socket. Correct position of programmed device in adapter's ZIF socket is indicated by picture near (usually on left above) the adapter's ZIF socket. On that picture, reference corner of device (e.g. position of pin 1) is indicated by dot, by number 1, by bevelled corner or by any combination of mentioned. Then release adapter's ZIF socket. Visual check interconnection between device and converter ZIF socket. If everything looks OK, close it and now, device is ready for programming. To take out the device from adapter, push the cover of adapter's ZIF socket and remove the device.